Project management has become the business world’s most sought–after skill set. As business environments become more complex, organizations are challenged with addressing a seemingly unlimited supply of new projects with fewer resources. Increasingly, a greater reliance is placed on project managers to help organizations ensure approved projects are not only delivered on time and within budget but more importantly - project results must accomplish strategic objectives. Despite this growing need for project managers, keen competition is expected for project management positions. Candidates who are certified, or have specialized training and industry experience will realize the greatest opportunities to advance and succeed. Small and large organizations alike will benefit from employees who have the critical knowledge needed to lead successful projects! 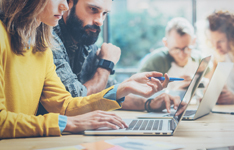 According to the Bureau of Labor Statistics, as project management becomes more widely-recognized, employers across industries are seeking employees with project management skills. Further, those with project management skills are proven to be of greater value to organizations as they coordinate and implement projects which benefit the organization as a whole. Florida Atlantic University offers a wide selection of in-class and distance learning project management training programs, ideal for learning comprehensive project management methodology, preparing for the CAPM®, PMP®, PMI-SP®and PMI-RMP®certification exams, or maintaining your certifications with specialized courses for project management professionals who would like advanced training or need to meet continuing certification requirements. Florida Atlantic University’s The Executive Certificate in Project Management uses a practical and academic approach to cover the fundamentals of the internationally-acceptedA Guide to the Project Management Body Of Knowledge(PMBOK®Guide). The curriculum covers the 5 PMBOK® Process Groups and 10 PMBOK® Knowledge Areas and explores each one and their interdependencies in the project lifecycle in depth. All participants will engage in group exercises to apply the tools learned in the classroom and are expected to complete a final project which will demonstrate practical application and mastery of project management methodology. Participants who enroll in the Executive Certificate in Project Management also have the option to attend an intensive 21 hour preparatory course for the Project Management Professional (PMP)®certification exam. Fill out your details to find out more about The Executive Certificate in Project Management: Evening or Weekend. Since I truly enjoy technical subjects and people, this program offered by FAY greatly helped me cement required for me to manage a project smoothly and effectively, and to better communicate the results to the audience (stakeholders) involved. ...and looking forward to seeing the text. I really appreciate Barbara going beyond and understanding my personal learning needs and respond to them. It will enhance the way I perform in my new job. The program has exposed me to the different tasks involved in project management and they will be applied in my every day job functions. This was a well-taught course with an excellent teacher.